Sitting at home, being bored so I thought I'd write together a summary of whats happened since the last post and some stuff that actually happened before I wrote the last one but I forgot about. I've generally had a pretty crappy day today. First of all this morning it was still raining. Then later during the day I had problems finding a place to get gas. It's actually amazing that sometimes when you are short of gas in probably the car densest place on earth it can be so hard to find a place to get some gas. While I was looking around for a place to get gas I was also backing into a parking garage I managed to break a rear view mirror of my car. To explain what I was doing parking in a parking garage whilst waiting for gas I was actually looking for a BestBuy to buy a new MP3 player since my current one has broken too (Didn't find one either). So I generally had a bad afternoon. The car breaking part was solved easily by just dropping it off at Budget and get a new one (In the end it's probably gonna cost me around $200). I've also just been down to Houston and at a rack of ribs that was really amazingly good and am just relaxing before going out inline skating because now the weather is great again (Even though it is dark now). So in the end the day doesn't look so bad, but if you'd called me at around 7pm this weekend I would probably have been pretty low before I could figure out how to handle the broken rear view mirror. 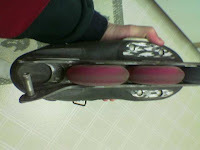 I've also included a picture describing how completely I've managed to destroy my favorite pair of skates which I'm now scrambling to find a good skating shop to get a replacement pair, so far without any luck. The two metal bars are supposed to be straight and the bar going from one of the sides should actually go all the way over to fix the wheel, lets just agree that wont happen anytime soon. Erik, do you think the new CrossMax 3 will be available in Sweden anytime soon? Called the social security office today since it's been 2 weeks and I hoped the would have my SSN ready. No such luck, they said it usually takes 4 weeks. I'll still call in a week, but I wouldn't have minded having been able to get a paycheck before I move into my real apartment at the end of next week since I then have to pay 2 months worth of rent for security and 1 month actual rent in advance... And they don't accept any credit cards, I haven't really figured out how I can get that much cash over here in a week but I'll think of something. Well, it's time to go inlining (On one of my other pairs). Everyone, have a good one.